This year, summer has been slow to arrive in many parts of the United States. We’ve had some cool spring temperatures — prime growing weather for spinach. Though hotter days are coming in now, there’s still time to fix a few more spinach salads before the season passes by. 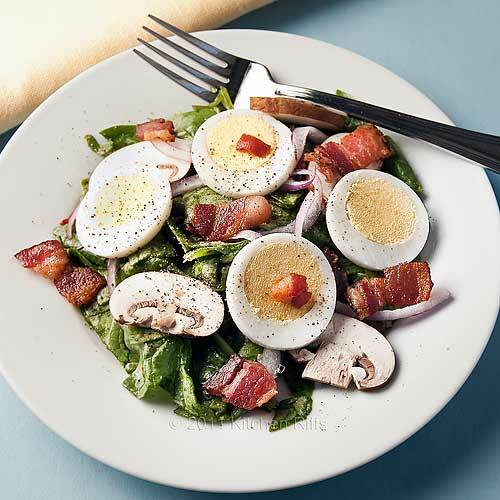 If you haven’t paired spinach with hot bacon dressing for a while, now would be a great time. And if you’ve never tried this combo, prepare to take your taste buds to 11. This is a classic dish that seems to have fallen out of favor in recent years. A mystery, given how bacon-crazed the food world has become. This recipe requires you to sauté the bacon slowly, which makes it crisp and renders as much fat as possible. You then add vinegar to the liquid bacon fat to make a vinaigrette dressing (the bacon fat replaces salad oil). Add the hot dressing to fresh spinach and the heat from the dressing wilts the greens. Simple, but incomparably good. And really, that’s the entire recipe (though I’ll add some details below). This recipe serves 4 – 6 as a salad course, or 2 (with generous servings) as a main course. Wash your spinach thoroughly (even the prewashed bagged stuff can be sandy at times). If the stems are woody, remove; otherwise don’t bother. Dry thoroughly. Place spinach in a large bowl that is heatproof (don’t use plastic — stainless or ceramic is best). Slice your bacon strips into pieces of an inch or less. Place in large, cold frying pan. Place on stove and turn heat up to medium. Slowly fry bacon until crisp (10 to 15 minutes). Meanwhile, slice your red onion. Wash, dry, stem, and slice your mushrooms. Peel your hard-boiled eggs and slice or dice (depending on your preference). 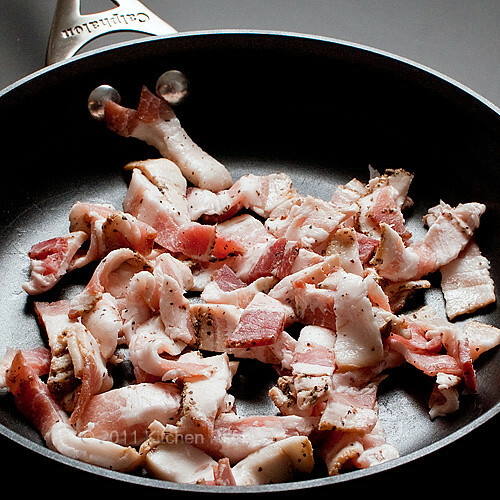 When bacon pieces are crisp, remove with slotted spoon and drain on a paper towel. Eyeball the rendered bacon fat in the pan. For this recipe, you want approximately equal parts of bacon fat and vinegar. If you have too much bacon fat (is that possible? ), just remove some until you have an amount you judge to be appropriate for your greens. (I never do this, actually. I always use whatever is in the pan.) Add about an equal amount of vinegar (either red wine or apple cider are tasty) to the hot fat and stir. The addition of cool vinegar to hot oil will cause some steam and splatter, so be prepared. Add salt and pepper. Simmer for about a minute. Carefully taste the dressing (it will be hot). Need more salt or pepper? Add a bit. Not enough vinegar? Add some. Kinda on the tart side? Add a little sugar, and stir to dissolve. Want a little extra kick? Stir in the optional Dijon mustard. Now dump the whole shebang into the bowl containing the spinach, and briskly stir to dress the greens (tongs work well for this application). The hot dressing will wilt the greens (which is what you want). Divide the greens onto serving plates. Garnish with slices of red onion, mushrooms, and egg. Top with bacon bits, and serve. At table you may want to add additional freshly ground black pepper. Hot bacon dressing can also be used with other hearty greens (like Swiss chard, dandelion, or baby bok choy). It can also be added to cooked, cut-up potatoes (turning them into German potato salad). For a nice variation, sauté the red onion about 5 minutes in the hot bacon fat to soften. (Do this after you remove the bacon pieces in step 4.) Then add the vinegar and proceed with the rest of the recipe. You could also substitute shallots for the red onion if you use this variation. Yellow onion is too sharp for this recipe, in my opinion. But if that’s what you have, give it a try. If you use yellow onion, I’d definitely sauté it in the bacon fat to tone down the flavor. This is a recipe where you can (and should) adjust measurements and ingredients to suit your personal taste. Don’t fancy eggs or mushrooms? Leave them out. Want to add some homemade croutons? Go ahead — they’re a great garnish. Prefer less dressing? Pour out all but 3 tablespoons of bacon fat, add 3 tablespoons of vinegar, and proceed. Want a less assertive dressing? Dilute with a bit of water. You can prepare this dressing ahead of time, cool, and then reheat before tossing the salad. Note that when you add the vinegar to the hot oil, there will be a loud sizzle. If you’re serving this to company, and they’re in earshot, the noise will invariably whet their appetites. Who can resist a good sizzle? While writing this post, I glanced through a few of the standard cookbooks on my shelf — and was surprised to find that most of them don’t contain a recipe for spinach salad with hot bacon dressing. Recipes for the dish do often appear in food magazines, however, and the web offers many versions. I particularly like the recipes from Saveur Magazine and Alton Brown. 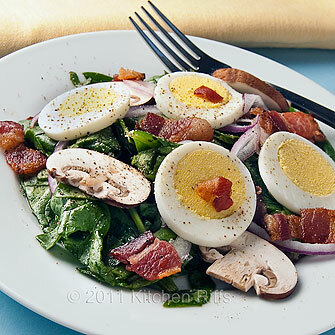 I first tasted spinach salad with hot bacon dressing at Karl Ratzch’s Restaurant in Milwaukee many years ago. I don’t remember what I had for my main course, but the salad made an indelible impression. Nowadays, with most of us eating lighter, the salad itself is substantial enough to serve as a main course. 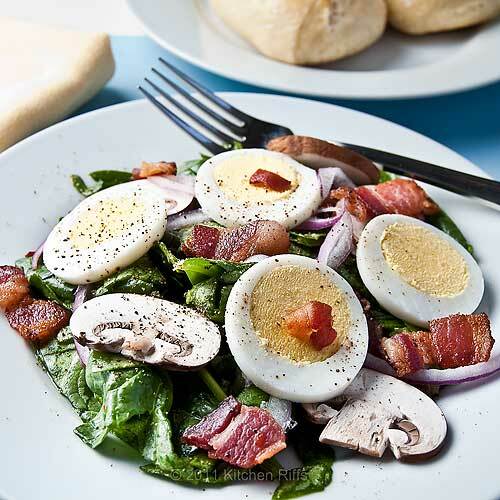 The egg and bacon add plenty of protein, and the spinach plenty of healthiness (let’s just ignore all that bacon fat, OK?) Add some bread and wine, and you’re all set. Hmmmm . . . a loaf of bread and a jug of wine? What more could I want, other than Mrs. Kitchen Riffs? I wonder if that Omar Khayyam fellow ever tasted Spinach Salad with Hot Bacon Dressing. Hi BT, thanks for the comment. I hope you enjoy the recipe, and that it lives up to your expectations. Hi Kate, thanks for the comment. Great info re Gravey's - thanks. I had this salad at Garvey's earlier tonight. I was not sure about the dressing when I ordered the salad, being worried that I might not like it. My fears were for nothing! This was hands down the best dressing I have ever had! I loved it...the entire salad was fantastic! I would recommend this salad and their trash chicken wings and legs to anyone. (that is apparently the name of one of their versions of wings). I am so happy to find this recipe!! Can't wait to make it...I hope it tastes just like the one at the restaurant. The dressing did not wilt my greens, and I am glad it did not...it just sounded unappetizing that they would wilt. Two of my tablemates tried my salad and they were as enamored with it as I am. I think they will order it the next time they are there. Hi Anonymous, I'm definitely going to have to try Garvey's sometime! Hot bacon dress will wilt the greens, unless there's not very much of it - that's part of the point, actually. It's not that the greens get all soggy and limp - they don't - but they're no longer crisp, and they lose some of their structure. It's a good salad, but unless you use very little dressing (or serve it on the side), the spinach will wilt. Thanks for the comment. Hi...they gave me quite a large serving of the bacon dressing in a separate container. The spinach was really fresh. I am not sure why my spinach did not wilt, but they didn't. Maybe the dressing was not as hot as it should have been, but it was so good, the only bad part was when I was done. It is the type of thing a person wants more of! :-) I hope you do go and try it. It is on Telegraph Road in St. Louis...kind of set back and behind a flower shop. Hi Anonymous, probably the dressing lost some of its heat. Plus there's no way a diner can properly toss a salad at table - they should really do this in the kitchen, or the waiter should take care of it. Pouring the dressing over the greens isn't really the same thing as tossing a salad, alas. Thanks for the update. Sorry to be another anonymous, but that is the only way I can post. I have also eaten this salad at Garvey's, and the spinach definitely does NOT wilt. I was there last night. This salad is beyond fabulous and does not need the spinach to be wilted. I am crazy about their bacon dressing. Your wilted spinach recipe may be very good, but I doubt it is equal to Garvey's. I agree with the other anonymous...the only bad part is getting done. This is the type of food you can't get enough of. I have to repeat, at Garvey's the spinach is better NOT wilted. As for those chicken wings, yum! Lots of meat on them and the flavor is also beyond fabulous. Hi Anonymous, I haven't eaten at Garvey's so I can't compare. But it sounds as if their salad is somewhat different. For this salad, the spinach is supposed to wilt. The spinach still tastes quite fresh and does not turn hugely limp; but it definitely wilts (loses a bit of body and crunch), and is supposed to. As I said in the comments earlier, this is part of the point of this salad; so if Garvey's wilts, good as it may or may not be, it's a similar but not identical salad. We may be quibbling over semantics here (maybe we both have different definitions of "wilt"). You should make mine and report back. ;-) Thanks for the comment.